This delicious meal was light and healthy and at the same time very quick and easy. It was kind of a last minute decision and it came out great! It was SO flavorful and so perfectly cooked. I can’t wait to make it again!! I bought fresh Asparagus and fresh Potatoes and I had some Organic Chicken in the freezer that I took out this morning. 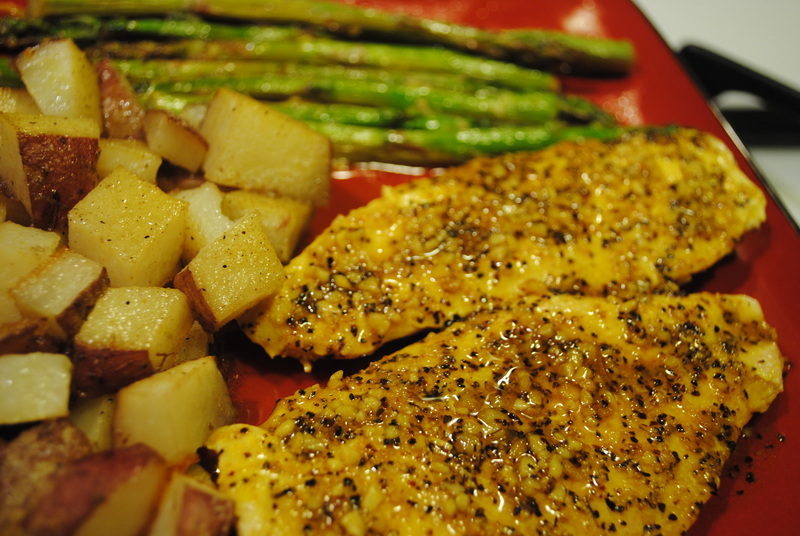 I cooked the Chicken and Asparagus right in the same pan and I roasted the Potatoes in the oven, and then gave them a quick broil to give them a little crunch. Preheat oven to 425°F. Chop Potatoes into Medium-Large cubes, oil the pan, and spread potatoes evenly on pan. Drizzle oil over all potatoes and sprinkle Adobo Seasoning generously over potatoes. Place in oven. Place approximately 3-6 tbsp butter into a pan and melt. Put chicken in pan, drizzle lemon juice over chicken, and sprinkle with lemon pepper seasoning. Let cook on medium heat for approximately 10 minutes. Turn over chicken and drizzle with lemon juice, then sprinkle again with lemon pepper seasoning. Continue adding butter if pan starts to get dry. You should have a good amount of liquid at all times. Sprinkle minced garlic around chicken in pan. 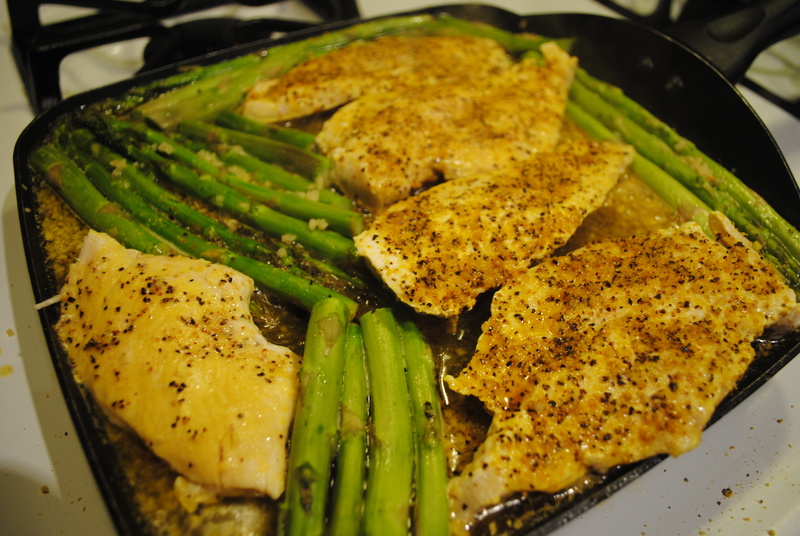 Clean ends off asparagus and place in pan with chicken. Add lemon juice and butter if needed. Let cook until chicken is cooked through and no longer pink in the middle. Leave on burner, turn off heat and let sit. Just as your chicken is about done cooking, turn oven off and turn broiler on high. Let everything stand approximately 5 minutes. Serve with lemon slices. I have read some just right stuff here. Definitely value bookmarking for revisiting. I wonder how a lot effort you put to make this kind of wonderful informative site.